Years ago, we established The Southern African Girls Coffee Club. It’s an unthreatening place for those of us with roots there, to gather and let our hair down for three hours. We all have one thing in common: homesickness in one form or another. The girls and I all share a story. Our driving forces vary, but our peculiar humor is just the same. We all long for the smells and the tastes of home whilst the sounds of our own brand of pickled languages and words are mixed in a potjie pot, and enjoyed along with easy laughter. On these occasions especially, I celebrate the Baobab Tree which is sometimes called “The Upside Down Tree” because its branches look just like roots. The roots grow strong and fortify the tree, as above ground, the root-looking branches grow upwards three or four stories. Like the Baobab tree, our solid African roots ground us with values and morals that allow us to grow. Through circumstance we find ourselves branching out in different ways, in different directions and in different climates. Our challenge is to diligently nurture our roots and to ensure they will support us. Because I’m no chicken, you see, my roots are deep and my branches high. I’ve lived half my life in South Africa and the other half, in America. I am the quintessential Baobab Tree. And proud of it. 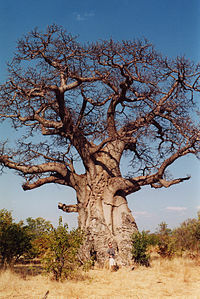 A single Baobab Trees can hold up to 4,500 liters of water highly valued in arid areas; fibers from the bark can be turned into rope or cloth, it’s said to have hundreds of cures for ills and hollowed out, the trunks can provide shelter for as many as 40 people.